Top anti aging skin care tip- Unhealthy habits such as smoking, drinking, and eating a poor diet play an important role in what can speed up the aging process and add years to your life. These factors we do have some control over. The rest is up to your genes and the normal aging process. Stress- Stressful events can affect your health, trigger skin reactions, and upset your life. Unhealthy situations tend to develop when you are stressed. Stress can reflect how your skin looks. It’s important for you to learn to cope and release stress to stay healthy and keep your skin looking younger. One known way to consider is -Exercise is good for your overall health. It flushes out bad toxins, improves circulation, and carries oxygen/rich nutrients to the skin layers. Diet- Adopting good nutritional habits is not only healthy for your body but it also plays a role in the effect it has on your skin. Antioxidant rich foods are always a good defense against free radical damage.A good source of Vitamin A,B,C, & E is fruits and vegetables. Include other food groups to maintain a well balanced diet to also protect skin quality and its elasticity such as seafood, lean meat, nuts that provide zinc, selenium, and healthy fats. Get beneficial omega-3s in flax seed and fish such as salmon and tuna. Smoking- Everyone knows the consequences with cigarette smoking that it’s bad for the body and your skin. Smoking contributes to premature aging in many ways. It prevents oxygen and essential nutrients from reaching the skins epidermal layer because it constricts blood vessels. Our collagen protein that keeps skin smooth and supple is attacked and when broken down will allow wrinkles to settle in. As the inner layer of skin thins and becomes more fragile, the loss of fat also makes skin sag. Sun Damage- Sun damage overtime also contributes to aging of the skin. The elastin fibers are damaged by the sun’ UV (ultraviolet) light, causing the skin to sag and stretch. Years of sun damage will also show up blotchiness, discoloration, redness and possible cancers. Prevent unnecessary damage by using a broad-spectrum sunscreen, limiting your time in the sun, use protective clothing, hats and sunglasses. Well groomed eyebrows will enhance your appearance. 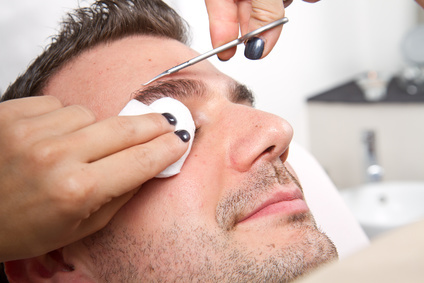 Most men can keep eyebrow maintenance to a bare minimum for a clean look and easy upkeep. As men age they tend to get hair in unwanted places, such as the ears and nose and eyebrows often get long, bushy, and unruly. To keep your eyebrows in good shape, trim /tweeze any unruly wild hairs and unwanted stray under-brow hairs. Don’t try to create an arch. Keep it simple, masculine and natural. Unibrow- Tweeze away any unwanted hairs that bridge together the right and left eyebrow over the nose. Tip- Use a quality pair of tweezers. Ideal time is right after a shower. Hold skin taut with your free hand. Grasp hair firmly and tweeze hair out in the direction it grows. Eliminate unsightly hairs that extend below the nostril. There are a number of trimmers on the market specifically designed to groom unwanted hair from the nose/ear area quick and easy. Constantly squinting can cause deep furrow lines and fine wrinkles around the eyes. Wear UV protection sunglasses to help avoid the need to squint in bright sunlight. Screening damaging UV rays from your eyes will also help delay eye area wrinkles from forming. The skin around the eyes is extremely fragile and susceptible to wrinkle formations. Always include an anti aging eye cream in your daily regimen to help hydrate the area, delay, and diminish the appearance of any wrinkles. 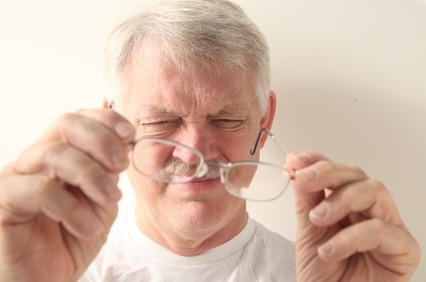 Squinting may also be a sign indicating you may need a vision check from an eyecare professional. The convenience of soaping up in the shower to wash your face and body may be tempting however, most bar soaps are too harsh and dry out the facial skin. Bar soaps designed for the body, usually have harsher ingredients that strip away moisture and fragrances added that can also irritate. A better choice to use is a separate sulfate-free well-formulated facial cleanser in your antiaging skin care regimen that is designed for your skin type. Facial cleansers come in various high-performance, quality gel, lotion, or cream formulas. It’s important your anti aging skin care regimen is kept updated and products/ingredients tweaked to your own personal issues. A proper skincare regimen is the foundation for healthy skin at any age. Taking care of your skin and sticking to a regimen with good health habits will ensure healthy, great-looking skin for the many years ahead for both men and women. Your skin will continue to change so its necessary to keep informed with any new product recommendations that can benefit your own personal issues as you age.